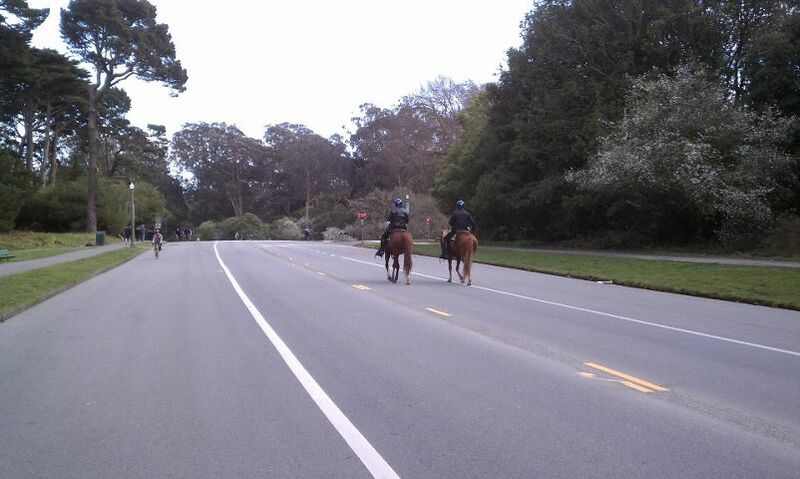 After repeated delays and some intermittent rain, the SFMTA has apparently begun construction of the city’s first parking-protected bikeway on John F. Kennedy Drive in Golden Gate Park. The center lane striping appeared mostly grinded off on the western section of the road yesterday from Transverse Drive just past Stow Lake Drive. Construction equipment also sat at a spot where some digging had begun, possibly for drain work or curb ramps. The SFMTA has said it should be finished in March, weather permitting. Car-free, as it should be every day. Totally agree. Why do cars need to be in the park at all? Can’t our parks be the *one* place where cars don’t utterly dominate our city and cyclists and pedestrians don’t have to worry about getting run over, listening to their obnoxiously loud engines, stereos, and horns, and sucking their exhaust fumes? If nothing else, we at least need to eliminate all the cut-through roads (And I’m looking at you Chain of Lakes Dr). It’s bad enough people *using* the park are driving in it, but quite another that people use it not to visit the park but as a short-cut to get around in the city. 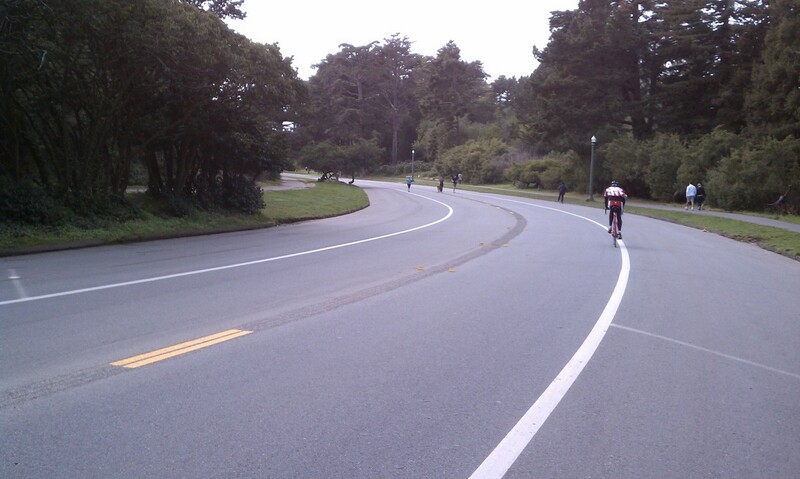 I think there should be only a single loop road through the park that has only one entrance (say at Stanyan). The loop already exists: JFK to MLK to Kezar. Eliminate all other roads (with the exception of Park Presidio which there is no way we’ll be able to remove anytime soon). This way, if you drive through the park, it would only be because you are going there, not cutting through. More long-term, we ban private auto traffic on this loop road and it is only used by shuttles for the elderly/disabled, maintenance vehicles, and emergency vehicles. Otherwise, it is always car-free. Now that would make GGP world-class! Baby steps. New York City has come a long way towards making Central Park and Prospect Park car-free, but we’re still not there yet, even though every community board and many elected officials representing areas surrounding the park support the idea. The city began taking time and space away from cars in the park back in the 1960s, and has steadily cut hours and space over time, including closing many entries and exits. Now, the West Drive of Central Park is only open 8am-10am Monday-Friday, and is only open to HOV vehicles, a law which is heavily enforced (I see checkpoints there all the time). But even in heavily car-free Manhattan, we still can’t seem to close the drive 24-7. We’re close, but not there yet. In SF, maybe aim to cut back hours and reduce entry and exit points as the next step after weekend car restrictions. Good luck! Agree as well. The park is so amazingly alive on Sundays when it is car-free. This is the only place children can roam freely and safely and satisfy their curiosity. And you see all walks of life from skaters to swing dancing to people in costumes. Most parks are too small for children to do this. jd_x, Your comment about severely limiting car traffic in the park to actual visitors, not cut-throughs, got a lot of “likes”. And rightly so — your proposal makes common sense and yet shows a couple of different ways to keep the park accessible to the elderly and disabled who need a ride into and through it just to “see” it, even if they can’t frolic. I know, because that’s how I take my disabled mom and enfeebled father to Golden Gate Park. And yes, it is terrible to walk along the Park’s southern edge weekday mornings — it’s a commute road for those wishing to avoid Lincoln Boulevard’s congestion. A walker/biker can barely enjoy the Park with the stream of speeding cars alongside the pathway. JFK Drive Bikeway Street Plans Released. Construction Coming Next Week?